I’m delighted to announce that I signed a Lexington Books contract for Media Marathoning: Immersions and Morality. I’m currently revising in response to peer feedback. The book may even be in print by the end of this year. I look forward to kicking off a scholarly conversation about media marathoning. In 2013, the popular press exploded with stories on binge-watching, but scholarship hasn’t kept pace. I’ve enjoyed reading about binge-watching in various online and print media outlets; however, I have been frustrated by their focus on television content, television distribution, and television executives. 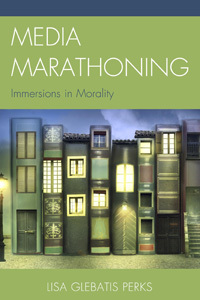 My book captures marathoners’ immersive interactions with television, books and film. And, instead of taking a top-down approach to the subject, I capture the voices of the marathoners themselves. Drawing from four years of systematic research into media marathoning, my book answers the following questions: How are people marathoning? Why are they marathoning? What are they marathoning? And what do commonly-marathoned texts offer to their readers? I answer the first two questions by analyzing over 500 typed pages of marathoner discourse gathered through interviews, surveys, and journals. This book argues that these intensely engaging texts forge a liminal space between lived experience and fictive world that enables readers to negotiate the nuances of morality. I liken the marathon experience to the journey through the wardrobe (of the C. S. Lewis variety): just as traversing the wardrobe’s threshold transports the Pevensie children between the Professor’s English home and Narnia, the marathon experience is the conduit through which the discourses of real and fictive worlds come into contact. 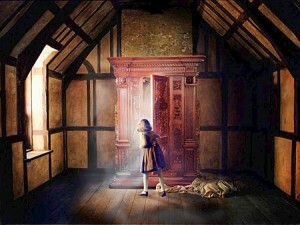 Lucy opens the wardrobe to Narnia. Although many of the marathoned texts are from the science fiction or fantasy genres, repeated character types and themes cut across both genre and medium, suggesting that these story elements are uniquely located within the constellation of commonly marathoned texts. In the character chapters, I draw connections between Magneto and Christian Grey, Katniss Everdeen and Luke Skywalker, Arwen Evenstar and Sheriff Woody, Agent Smith and Gossip Girl, Barney Stinson and Dumbledore, among other unusual pairings. If this post and my blog have succeeded in piquing your curiosity, I hope you’ll pick up the book. Take the journey with me to learn about the cultural impact of media marathoning, the new normal of media consumption.